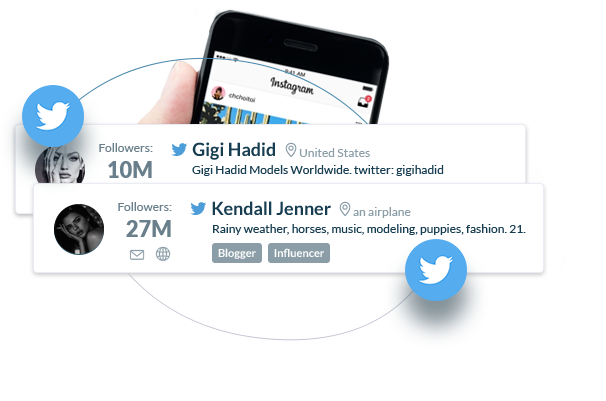 Find Twitter Influencers with a simple keyword search. Get access to a database with over 7 million Twitter profiles in any niche or country. you add and automatically sync any matches into a detailed contact card! and on which days. 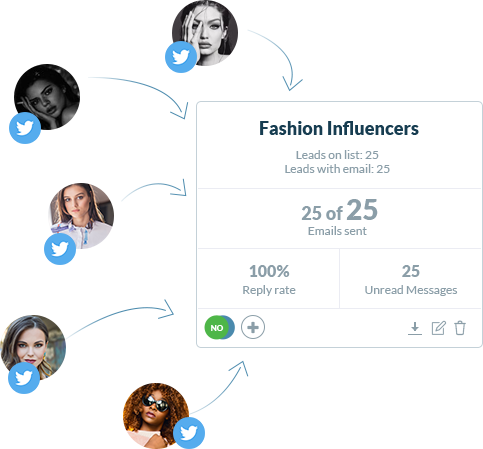 NinjaOutreach will automatically contact all Twitter influencers in your list with valid emails. up to 2 follow-up outreach messages for you. Start Looking for Twitter Influencers Now! of potential leads! The NinjaOutreach database is updated continuously. Use NinjaOutreach Smart Tagging to help you narrow your search faster. Choose to include or exclude any Twitter profile tagged as Blogger, Influencer, Executive, Company, or Journalist in your search results. Need to find a specific kind of social media influencer? Set the minimum and maximum follower count that you require. You can also filter Twitter Influencers by location! Want to find top Twitter Influencers instantly? Just sort your search results by follower count! You can also sort them by name or location in alphabetical order. Save your Twitter influencer leads to a list for future outreach campaigns. Keep a backup of your social media influencer leads. NinjaOutreach lets you export lead lists into a CSV. Start Saving your Twitter Influencers Now! Evaluate information about your social media influencer leads. Modify or add any flawed or missing data in each contact card. Search on Google, load the results on NinjaOutreach, review, and save valid leads into your list of leads! Just download and install the free Chrome Extension, then sync it with your NinjaOutreach account. The tool will automatically scrap duplicates for you. Know where your social media relationships and conversations are at with CRM features that let you view message histories, leave detailed notes, and categorize contacts by tags and relationship status. Send the right message. Get a comprehensive library of outreach templates for any marketing or link building purpose: guest posting, sponsored posts, expert roundups, product reviews, podcasts, interview requests, and more! Dynamic fields let you personalize outreach messages fast and easy. Filter who receives your outreach campaign messages. Include or exclude recipients depending on categories such as relationship status, tags, or participation in previous outreach campaigns. Ready to give NinjaOutreach a try ? got any questions ? maybe our support ninjas can help!